The Wanderlust 2017 committee has revealed the culinary and travel experiences that will be up for bid during Florida Gulf Coast University’s (FGCU) 28th annual Wanderlust 2017, taking place Saturday, April 1 from 6 to 9 p.m. at the Six Bends Harley-Davidson in Fort Myers, followed by an After Party at HeadPinz in Fort Myers from 9:15 to 11:15 p.m. 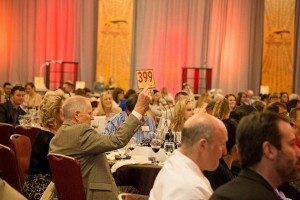 Bidders can raise their paddles during the culinary and travel auction extravaganza, which benefits students within FGCU’s School of Resort & Hospitality Management program. An array of unforgettable experiences will be awarded to the highest bidders during the live auction, offering a chance to go “California Coasting” during a three-night stay at the Hyatt Regency Mission Bay Spa & Marina in San Diego, California; go to “Vegas Baby” on a two-night stay for two people at the Four Seasons Las Vegas and a three-night stay at any Caesars Entertainment Las Vegas property; enjoy “The Scottsdale Royal Treatment” in Scottsdale, Arizona with a three-night stay at the Hyatt Regency Scottsdale Resort & Spa and a two-night stay at the Fairmont Scottsdale Princess, further enhanced with a trip to the spa and foursome on the TPC Scottsdale Champions Course; “Dine on Don (Schula)” during a Cakebread Cellars Wine Dinner, featuring a welcome wine reception and four-course wine dinner for 10 people at Shula’s American Steak House, along with a Garo Yepremian and Don Shula-signed copy of “Tales from the Miami Dolphins” and a two-night stay at the Hilton Naples; or go “Surf’s Up” in California with two nights at the Ritz-Carlton, Los Angeles, two nights at Ritz-Carlton, Marina Del Rey, and three nights at Hyatt Regency, Huntington Beach. The highest bidders of the silent auction packages will have a chance to enjoy a “Four for Fore” golfer’s dream, offering a round of golf for up to four people at four different golf clubs throughout Naples, including Wyndemere Country Club, Windstar Club, Heritage Bay Golf and Country Club and The TwinEagles Club; hit the slopes in Gatlinburg, Tennessee with a three-night stay for up to eight people in a spacious condo overlooking the ski slopes of the Ober Gatlinburg; discover your inner cowboy as you “Lose Yourself in Lost Pines Texas” during a two-night stay at Hyatt Regency Lost Pines Resort and Spa in Lost Pines, Texas; say “Guten Tag Vienna and Wolfsburg” during a two-night stay for two people at the Ritz-Carlton Wolfsburg, Germany, followed by two nights at the Ritz-Carlton Vienna, Austria; or spend a “Weekend in Beantown” with a two weekend-night stay at the Ritz-Carlton Boston. The evening will also include a Fund-A-Cause, allowing auction-goers a chance to give freely in support of the students within FGCU’s School of Resort & Hospitality Management program. The funds raised through the generosity of the attendees will be dedicated to uplifting students through scholarships, conferences and training opportunities for students. Tickets to the Wanderlust 2017 event are $200, $250 for both the Wanderlust event and After Party, and $150 for School of Resort & Hospitality Management alumni for the Wanderlust event and After Party. Those unable to attend the event in person can join virtually for a chance to stake their claim on the many auction items up for bid. Virtual tickets are available for $200, and $150 for School of Resort & Hospitality Management alumni. To learn more about the Wanderlust 2017 event, or for more information on sponsorships, ticket purchase and auction donations, visit www.FGCUWanderlust.org or email wanderlust@fgcu.edu. Florida Gulf Coast University (FGCU)’s School of Resort & Hospitality Management provides many opportunities for students to experience and learn about all aspects of the hospitality industry. This specialized degree program, which began offering classes in 2003, is the culmination of resort industry leaders working on behalf of the University to design and offer a degree program that is tailored to the dynamic and complex needs of the premier resorts in Southwest Florida. The 120-credit curriculum meets the challenge by marrying traditional hotel, food and beverage education with resort management, marketing and technology education. The Herbert J. Sugden Hall first opened to students in the fall of 2008. The 37,000-square-foot hospitality facility offers hands-on learning for School of Resort & Hospitality Management students and features wine and food demonstration labs, a multi-function ballroom, meeting rooms, lobby, concierge desk, pedagogical food production kitchen, indoor golf simulator and club repairs labs, prototype spa laboratory and traditional classrooms. To learn more, visit www.FGCU.edu/CoB/RHMBS.